On Saturday I visited Lingshan, Beijing’s highest mountain, with 吴岚 (Wu Lan). It’s a long drive – around 100km – but straightforward as it’s all along the G109. 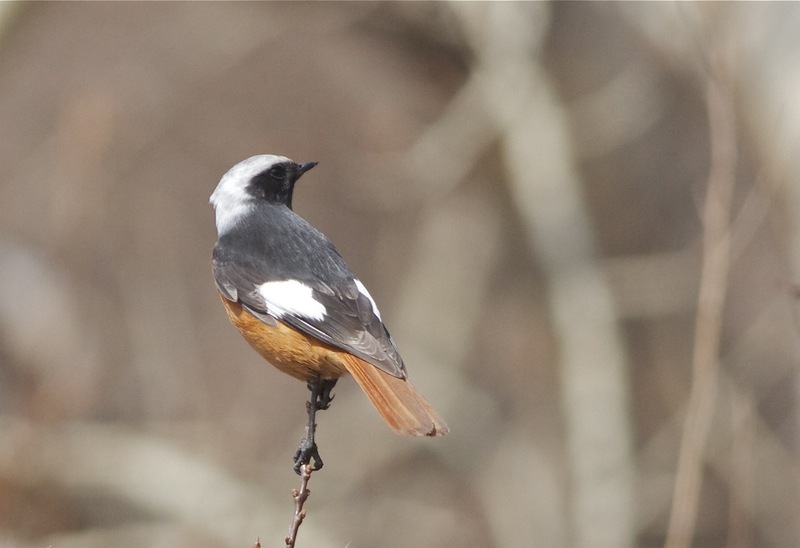 Lingshan was the location of GULDENSTADT’S REDSTARTS (红腹红尾鸲) last winter and looking for this species was one of the aims of the visit. Leaving well before dawn to miss the traffic, it was stunning to see the colours on the mountains change from a dark pink to a bright orange as the sun rose in the southeast.. Beijing’s mountains really are beautiful. 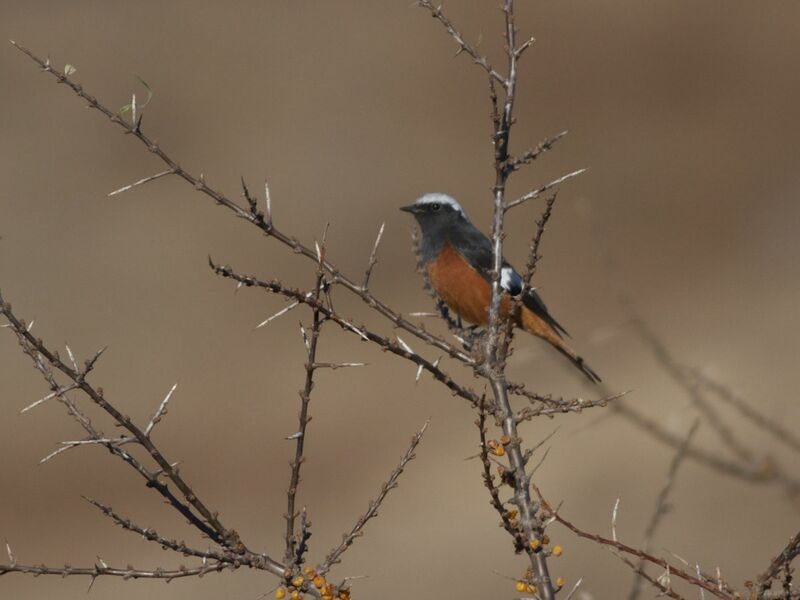 On arrival at Lingshan we quickly spotted a few GULDENSTADT’S REDSTARTS (红腹红尾鸲) on the sea buckthorn bushes near the peak. Stunning birds, especially in flight, there were at least 10 present in the area. The view from the top of Lingshan looking north east. 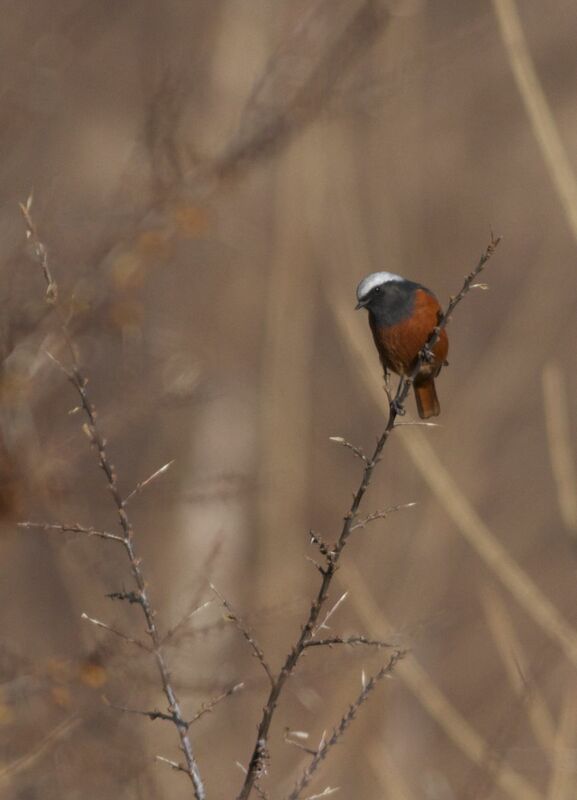 A male GULDENSTADT’S REDSTART enjoying the Sea Buckthorn berries at the top of Lingshan. I love the deep orange colour of the underparts. As well as the redstarts, there are also good numbers of PALLAS’S ROSEFINCHES (北朱雀) and DARK-THROATED THRUSHES (mostly RED-THROATED 赤颈鸫). PALLAS’S ROSEFINCHES are superb little birds. And Lingshan is probably the best place to see them in Beijing. 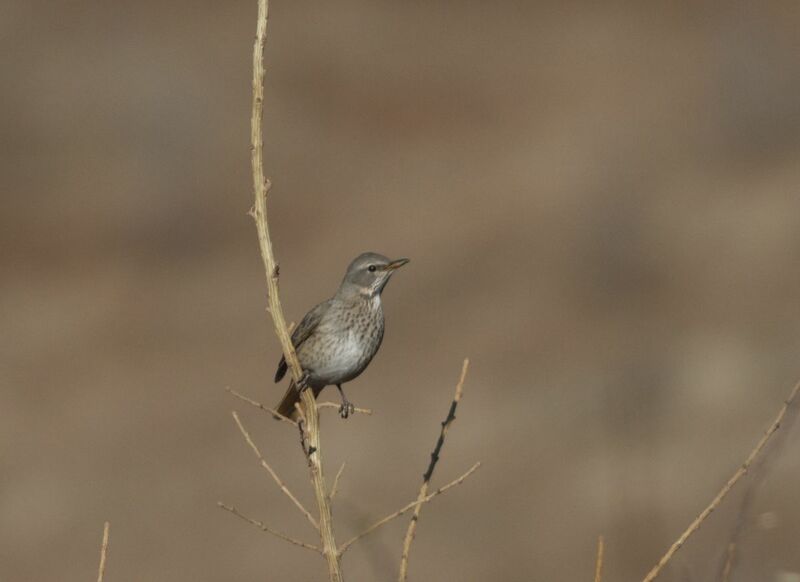 There are good numbers of Dark-throated Thrushes at Lingshan. This one is, I *think*, a young RED-THROATED (reddish tail) but not 100% sure…. could be some BLACK-THROATED influence. 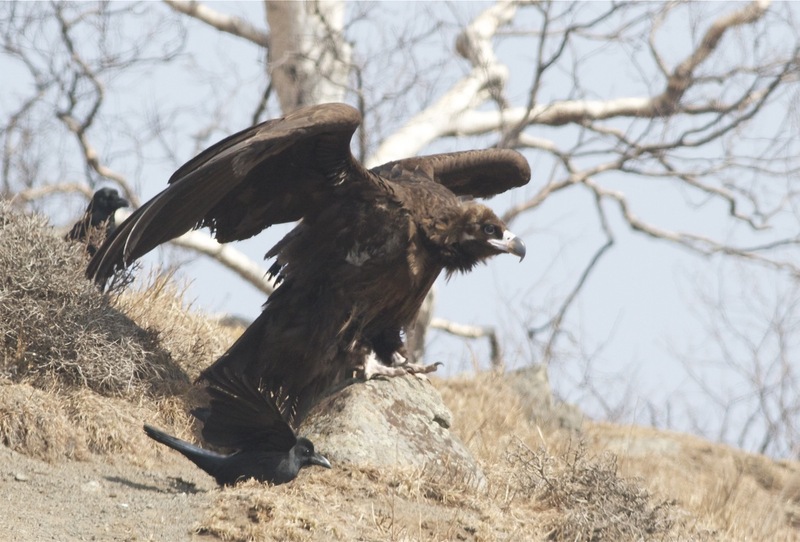 We had only been on the mountain a short time when we saw a distressing sight – a CINEREOUS VULTURE (秃鹫) that was clearly injured.. It was hobbling uphill dragging its right wing along the ground. 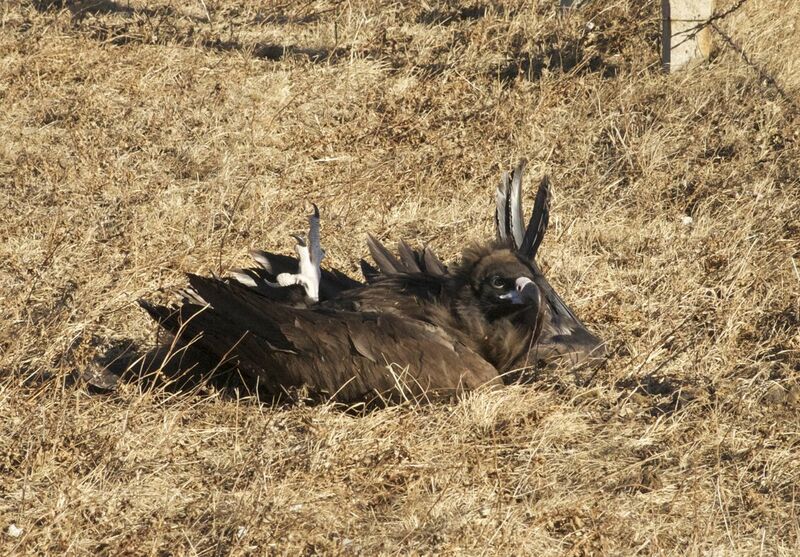 Our first view of the injured CINEREOUS VULTURE.. 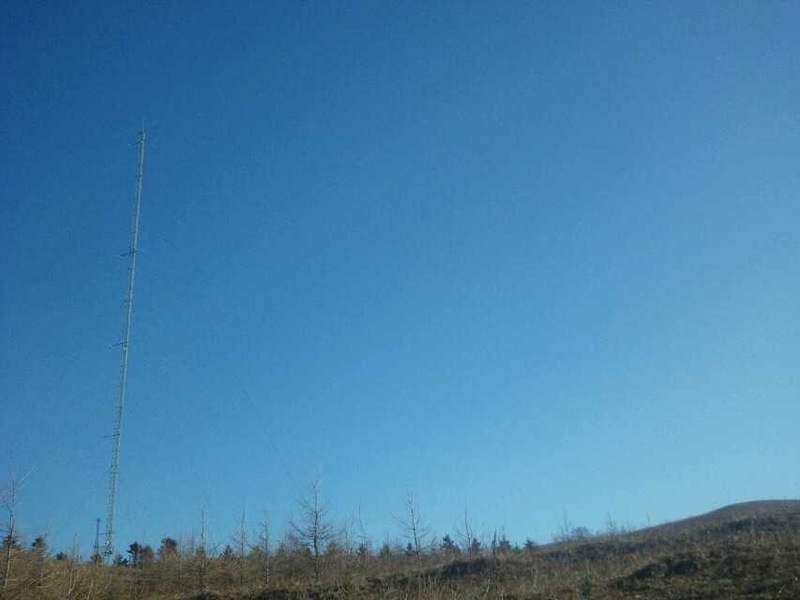 The vulture had almost certainly collided with one of the support wires of this nearby communications tower. The communications tower at Lingshan. This unfortunate vulture had almost certainly collided with one of the support wires, badly breaking its wing. It sounded easy. We just catch it, put it in the boot of the car and drive the 100km back to Beijing to the rescue centre. 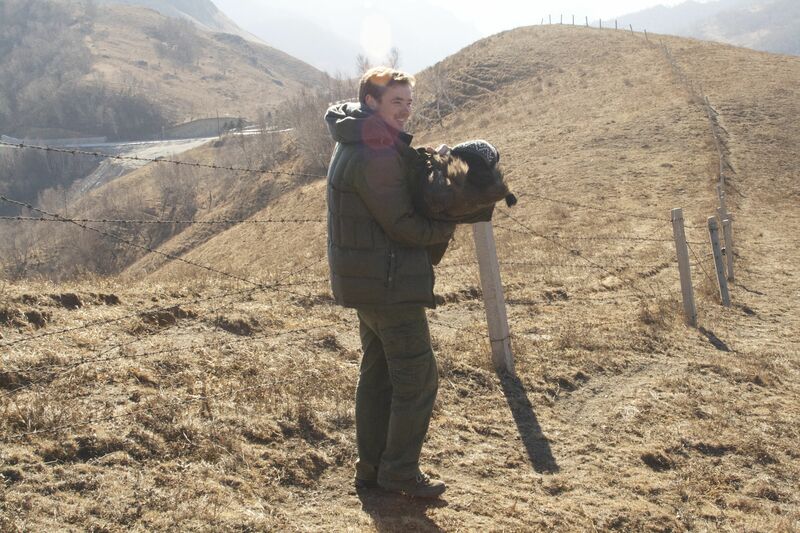 At this point I regretted not carrying a large box in the back of the car and, with no prospect of finding one on top of a remote mountain, we decided that covering the bird with my thick down winter coat would be the best way to capture it and cover it for the journey back to Beijing. We began the walk up the hill to where the we last saw the bird and, sure enough, we soon found it. It was laying on its back with its legs kicking in the air.. clearly in some distress. The vulture was clearly in distress as we approached it. At this point, 吴岚 (Wu Lan) was brilliant. She ran towards it and covered it with my coat before it had a chance to right itself and scramble away. 吴岚 (Wu Lan) just after ‘capturing’ the vulture. Wrapping it in my fleece and covering its head with Wu Lan’s hat, we were able to calm it and, after a couple of minutes, we lifted it (7kg as it turns out) and began to walk to the car. It was heavy and we both took shifts in carrying it down the hill to the car. Me carrying the vulture off the hill. At this point we were hopeful of the bird’s survival. We wrapped it gently in my coat and placed it in the boot of the car… It was big enough to sit upright in the backseat with a seatbelt on but, with a broken wing, it was clearly best to be in a dark place to minimise the stress. And so we began the journey back to Beijing, hoping for the best but fearing the worst. The injury was clearly very bad, with part of the wing bone protruding and lots of blood. It took around 2.5 hours to reach the raptor centre and, on arrival, the impressive 张率 (Zhang Shuai) was ready – she had already prepared the operating theatre – and the bird was immediately put under anaesthetic to allow a thorough inspection of the wound. 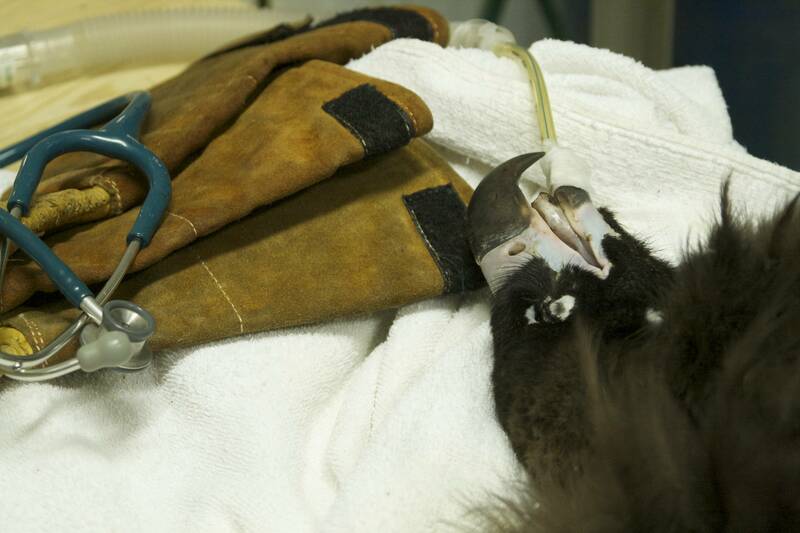 The Cinereous Vulture under anaesthetic. The wound was bad. 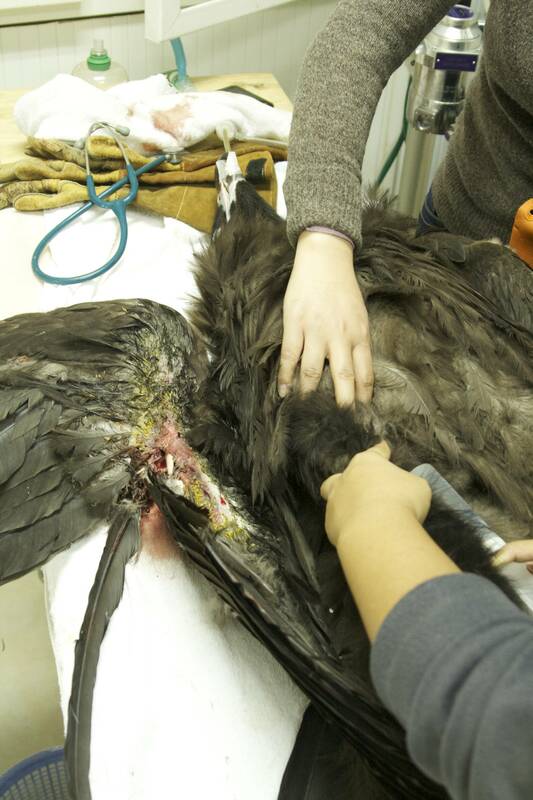 And the bird was injected with fluids to offset the blood loss and dehydration. 张率 (Zhang Shuai) got to work immediately and cleaned up the wound before taking an x-ray to assess the damage. 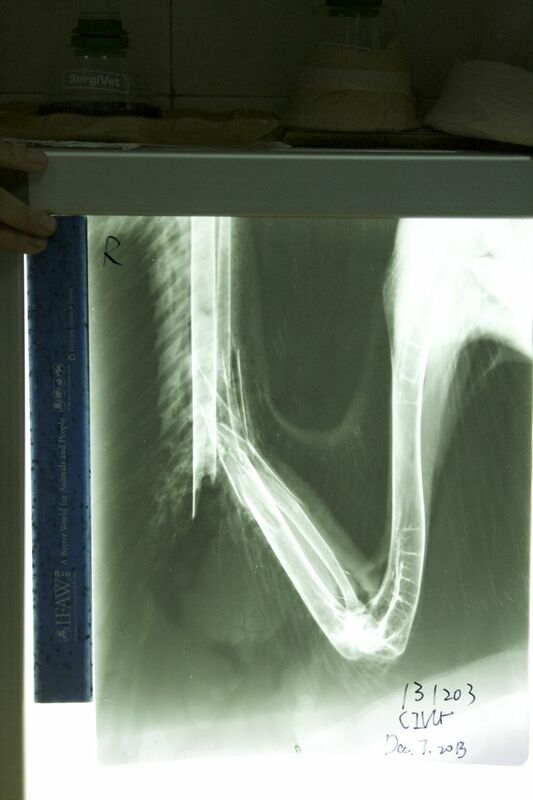 The x-ray revealed the terrible extent of the injury – breaks on both wing-bones with bad splintering. 张率 (Zhang Shuai) looked at us with tears in her eyes. We knew immediately what she was going to say. The injuries were too bad to fix and, with a bird this size, a life in captivity would be miserable for a majestic bird that is used to ruling the skies over the mountains of northern China and Mongolia. It was emotional for us all. This poor bird had been doing exactly what it was meant to do – patrolling the skies over the mountains looking for food – when it had collided, badly, with an alien, and almost invisible, structure. There was no option. This magnificent bird had to be euthanised. I can’t help thinking that if the support wires had been marked with flags or even painted a contrasting colour instead of the almost unnoticeable silver grey, this bird might have seen them and taken evasive action. It seemed such an unnecessary, and desperately sad, death. 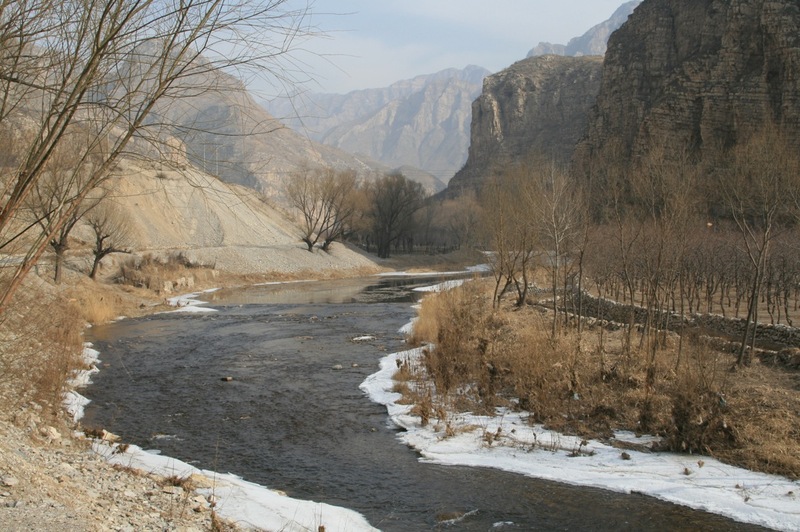 After Jan-Erik’s report of a flock of 40+ ASIAN ROSY FINCHES at Lingshan on Sunday 10 March, I returned to this fantastic winter site to try my luck. After the 2.5 hr drive from Beijing, we arrived at the peak at around 0800. It was a fantastic morning with -7 temperatures and light low cloud causing a beautiful frost. 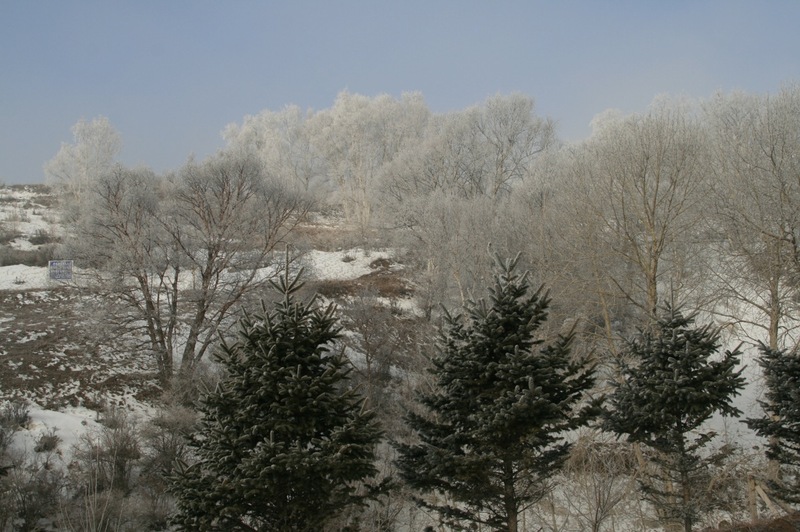 Lingshan in the early morning frost. The cloud burned off quickly to leave a stunning vista that was reminiscent of a Christmas card. With almost no wind, it was a super day to be on the mountain. First stop was the slope where Jan-Erik had seen the finches on Sunday. 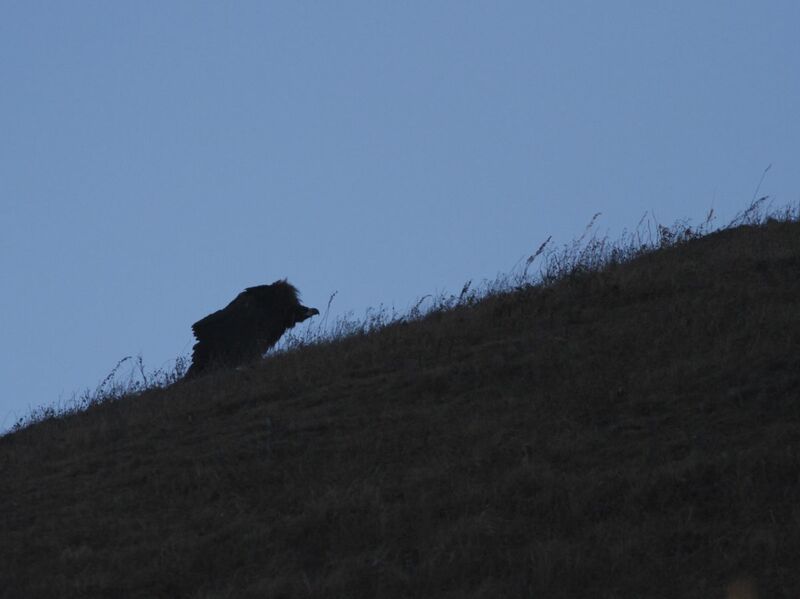 We scanned this and each nearby slope carefully but to no avail. 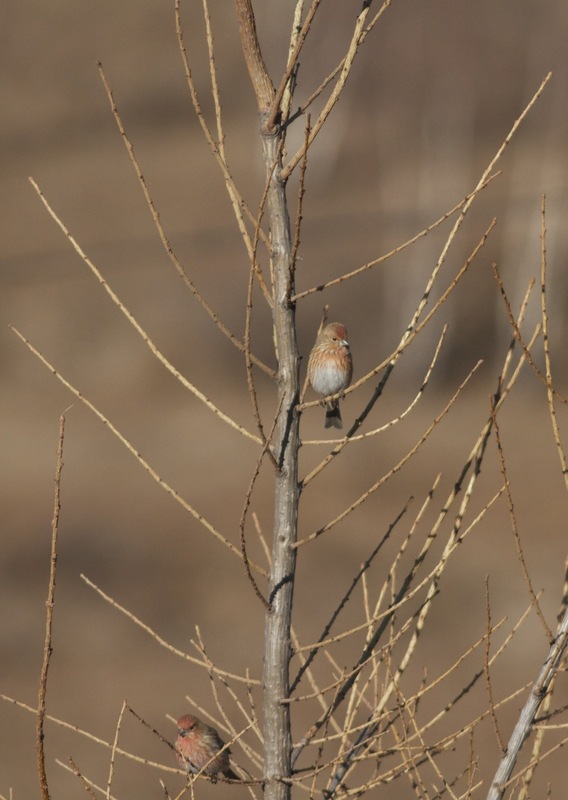 The lack of wind meant that bird calls could be heard at large distances and I was confident that given we couldn’t hear them, the Asian Rosy Finches were not around, at least not in the immediate vicinity. After trying a few other nearby slopes we decided to have a change of scene and to move on to the site where the GULDENSTADT’S REDSTARTS had been to see if they were still there. They were. We counted at least 17 (including 9 females sitting together at one point) and we enjoyed these birds for half an hour or more as they regularly dropped down to the berries. There were two more further up the road, making at least 19 in total. A very healthy count. A stunning male Black-throated Thrush, along with a few Red-throated, were enjoying the same bounty. Guldenstadt’s Redstart (male), Lingshan. This bird is a first winter male (brownish tips to the primaries). Guldenstadt’s Redstart (male). 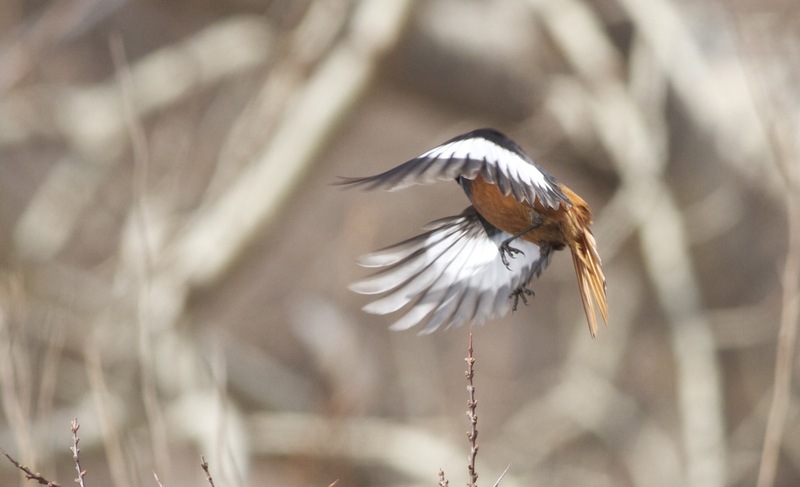 Take-off shows the extensive white wing patches (hence the alternative name of “White-winged Redstart”). We returned to the top to the area around the derelict buildings and were gob-smacked to see a CINEREOUS VULTURE perched on a boulder close by the track, much to the annoyance of the resident Large-billed Crows, which it positively dwarfed! Wow… What a beast! Cinereous Vulture, Lingshan. This bird was constantly harassed by the Large-billed Crows. At one point, one even jumped onto its back! Again we scanned the slopes with no luck and decided to stop by one of the ridges to have some noodles for lunch… I was beginning to feel that it just wouldn’t be our day and that maybe the Asian Rosy Finches had moved on. However, just as we finished the most delicious pot noodles (they taste so good when you’ve been outside all morning! 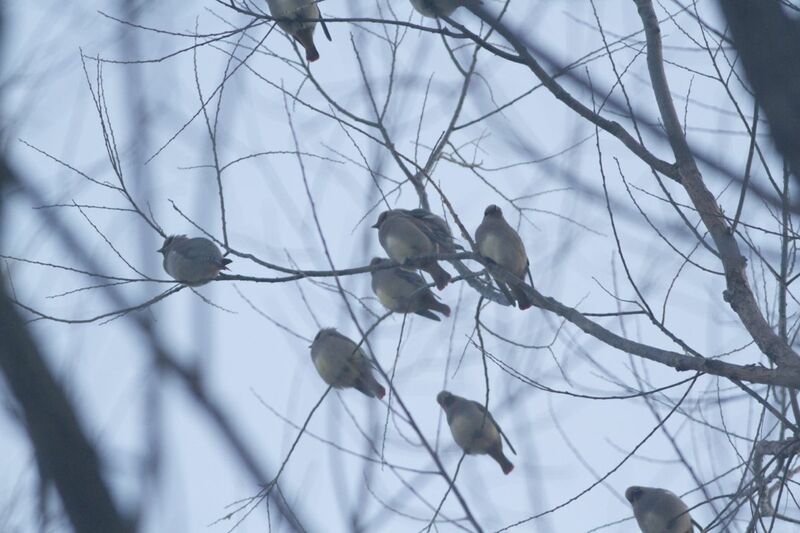 ), I could hear a bird heading our way uttering a finch-like call that I did not recognise.. I got on to it and saw it was accompanied by a second, and watched both through my binoculars, unfortunately in bad light, as they passed us. 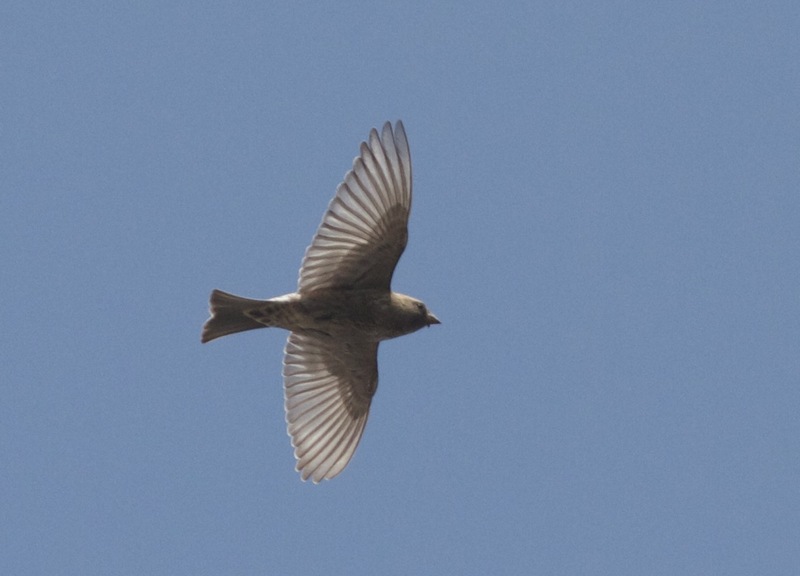 From the silhouette I could see they were largish finches with an almost lark-like flight. Sturdy birds relative to Pallas’s Rosefinch. I suspected they were ASIAN ROSY FINCHES but wasn’t 100% sure. Fortunately, I kept my binoculars on them and they turned and headed back towards us, this time heading right overhead. I grabbed the camera and took a couple of record flight images as they passed. They headed east and then banked north, eventually being lost to view behind a rocky outcrop. I looked at the images on the camera and, although they won’t win any prizes, I thought that there was probably enough detail to identify them as Asian Rosy Finches. This was confirmed when I looked at them on my computer screen… Result! Asian Rosy Finch in flight. 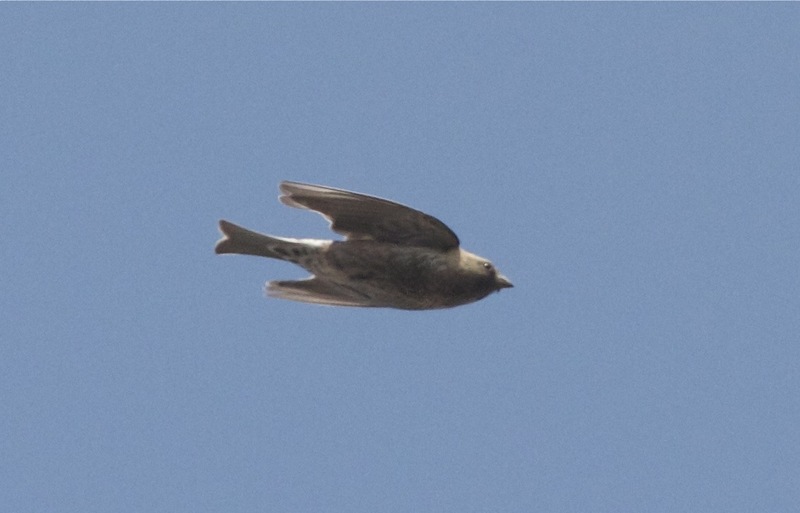 The markings on the undertail coverts, forked tail and head colouration all help to confirm the id. Asian Rosy Finch, Lingshan. Patience rewarded. An adult Golden Eagle passed at head height shortly afterwards and, a few minutes later, a party of 6 Red-billed Chough. It was still a stunning day and a real wrench to eventually tear ourselves away from the mountain top. 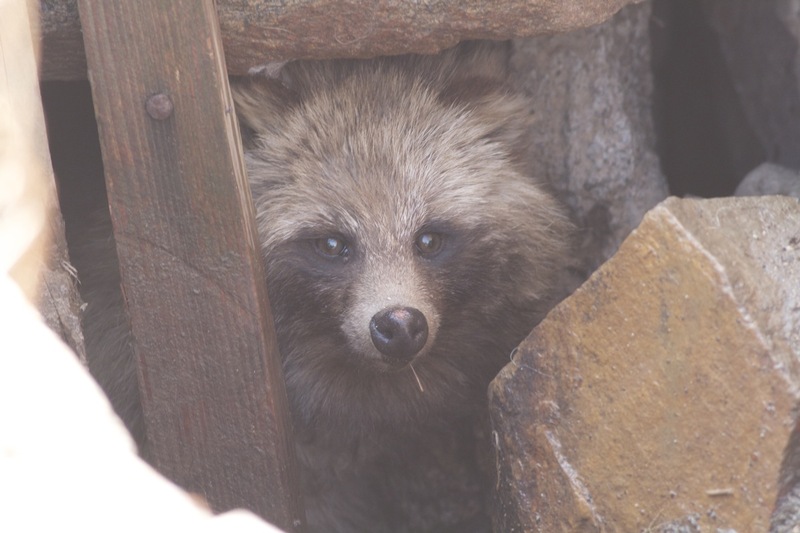 A couple of Racoon Dogs (apparently recently released) were also hanging around the derelict buildings but there was no sign of any Pallas’s Rosefinches. This Racoon Dog, apparently deliberately released last weekend, was holed up in a drainage channel. BROWN ACCENTOR (Prunella fulvescens) is a bird that I have been optimistically looking out for all winter… checking all those Siberian Accentors is a tough job but someone has to do it, right? 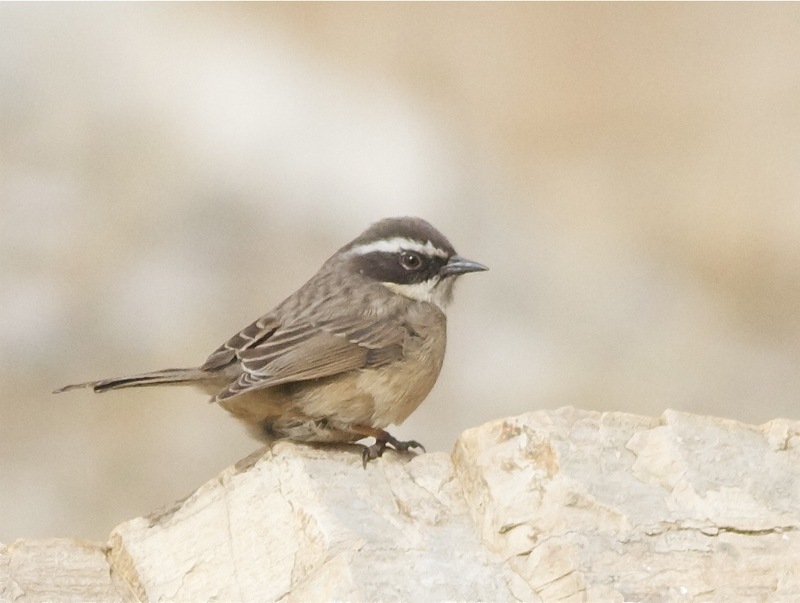 By rights, Brown Accentors shouldn’t be in Beijing. They breed to the north-west and only the occasional straggler makes it to the capital and is seen. I am aware of only one record, at Shidu, a few winters ago and I don’t know any details such as date or precise location. 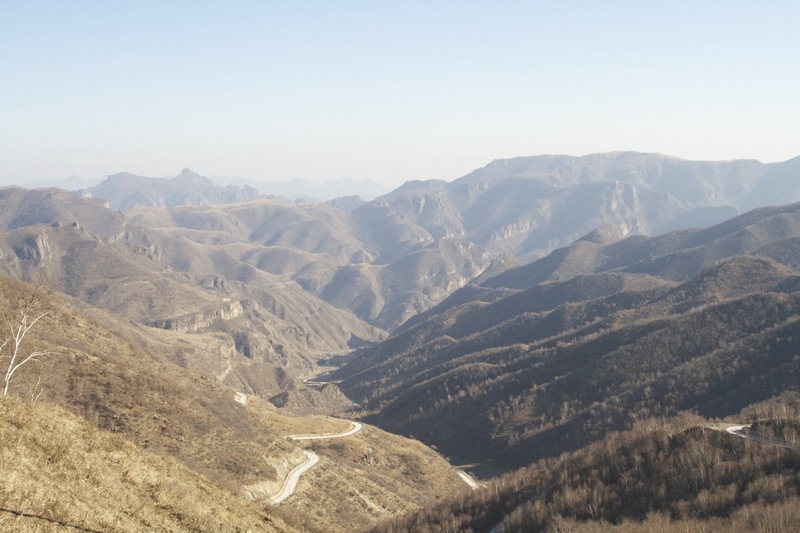 The mountains to the west of Beijing, on a clear day, are simply stunning. And there are some good roads that help to get you into the heart of this territory where some of the special mountain birds can be seen. We arrived on site at around 0900 after a 2.5 hr drive from central Beijing and it was immediately obvious that we would have a good day. A Cinereous Vulture soaring overhead and landing on a rocky outcrop was a great start. And soon after we were enjoying views of 4 Golden Eagles soaring together, with one even displaying as Red-billed Choughs called and wheeled around the peaks. We reached the Beijing/Hebei border and parked up. A narrow paved road winds to the north, following the Yong Ting River and it was along here that we were told the Brown Accentor had been seen. The habitat in Mentougou District. Stunning scenery. A couple of false alarms with Siberian Accentors sharpened us up and, before long, we came across a small flock of Godlewski’s Buntings feeding alongside the track. Checking them carefully, we spotted a couple of Meadow Buntings amongst them and then, suddenly, Jennifer said “ACCENTOR”… No sooner as she had said that, the bird in question dropped behind a boulder and it was an agonising few seconds before it revealed itself again and showed that it was indeed the BROWN ACCENTOR we had hoped for. We watched it for a good 20-30 minutes as it fed around a group of rocks at the base of a cliff-face, in typical accentor style, creeping along the ground with short hops. 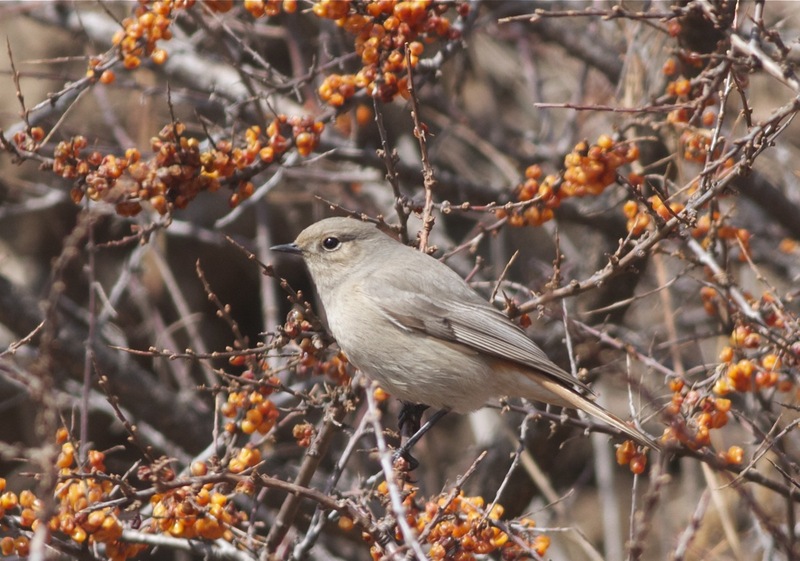 Unfortunately for Beijing ‘listers’ this bird seems to prefer an area of rocks just 500 metres over the border into Hebei Province.. maybe some Beijing birders will put down a trail of birdseed luring it over the border…. !